During my sophomore year I realized that I had room in my schedule for an additional minor. My Spanish professor (Shout out to Professor Beibe!) informed me that the LGBTQ studies program was about to get started. It just sounded like something I would really enjoy. I was really interested in studying LGBTQ issues from a variety of different perspectives and the interdisciplinary nature of the program really gave me that opportunity. The minor has actually had far more practical importance than I originally had expected it would have. 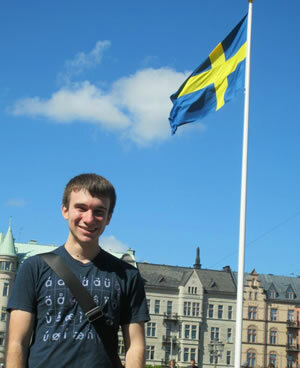 I interned at the U.S. Embassy in Stockholm last year during a study abroad experience. When they learned that I was minoring in LGBTQ Studies the political section put me in charge of creating an action plan for the embassy to reach out to the LGBTQ community in the county. It basically became the cornerstone of my internship. Many human resources departments are also looking for people with LGBTQ studies minors as they begin to implement non-discrimination polices. I have really enjoyed the interdisciplinary nature of the classes. I study Political Science and History and these classes often draw on these topics while looking at issues of gender as sexuality in a way that you normally don’t experience in strictly political science or history classes. I was really surprised by the way the classes have been structured. Most of the classes even at the introductory level operate more like a hybrid between a seminar and a lecture-based course. This allows for some really interesting discussions on different LGBTQ issues as many people come from different countries and cultures. It’s really neat to see how other societies view issues of gender and sexuality. I hope to someday become a Foreign Service Officer. As the government begins to push for LGBTQ rights as human rights on the international arena having a Foreign Service Officer in an embassy with knowledge on LGBTQ issues can be critical for that embassy’s implementation of LGBTQ outreach efforts.